On the crest, to the right of red n°49, 15m above Le Pilier Légendaire. Crouching start with a crimp right hand at the tree and a horizontal hold for the left hand, dyno to the top and exit via a mantle. 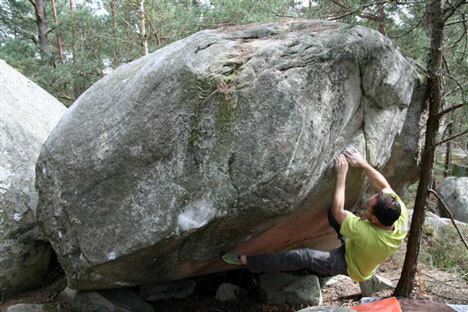 Sorry John, no way this is 7a, i think you did't try any other methods with the dyno, next time you pass there you have to try it like this : start as discribed, go with your left foot far high (good foothold), balance, put your right hand next to your left and make the dyno. Or you eliminate that by putting it in the discription.